MyBinding carries a large range of strap clips for safe securing all of your badge holders and important identification materials. For those of you going green, you will be pleased to know recyclable plastic clips are available. Standard clear vinyl straps, reinforced vinyl straps, Mylar straps, nylon straps, frosted plastic straps, frosted nylon straps, or colored vinyl straps are all available for your varied needs. They come in a plethora of spectacular colors and a variety of clips including smooth faced, ribbed, thumb-grips, knurled, 1-hole, 2-hole, "U" Bulldog or suspender clips, we have all combinations available to ensure readily available and instant access of your identification. This is MyBinding video. Here at MyBinding.com, we carry a huge range of Key Rings and Findings strap clips for securing all of your badge holders and important identification supplies. 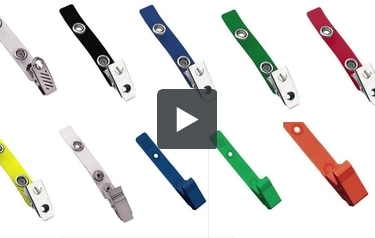 Whether you need standard or reinforced vinyl, mylar, nylon or frosted plastic straps, we have them. And if you need color, we have color – lots of colors. And, of course, we sell everything in bulk so the price is great for you. And when it comes to clip choice, we have a lot – smooth faced, ribbed, thumb grips, muraled, one-in-two hold, U-bulldog or suspender clips. We have eco-friendly or recycled versions of these products as well as many others on our website. We believe in customer service and do plenty of custom orders. So give us a call, give us a challenge. When image matters, MyBinding.